For my birthday and Christmas, my mom will sometimes buy me cute hand towels for the kitchen. Every once in a while she'll pick up a holiday-themed one with a homemade handle from a craft fair. I like these ones because they button/snap/velcro and will stay hooked to a handle and won't drop to the floor. My cousin's wife pinned this cute idea on Pinterest which was linked to this pattern. I printed out this pattern and went to work on my first handle for a towel. I can't take credit for the pattern or the steps, so I'll just briefly share what I did. 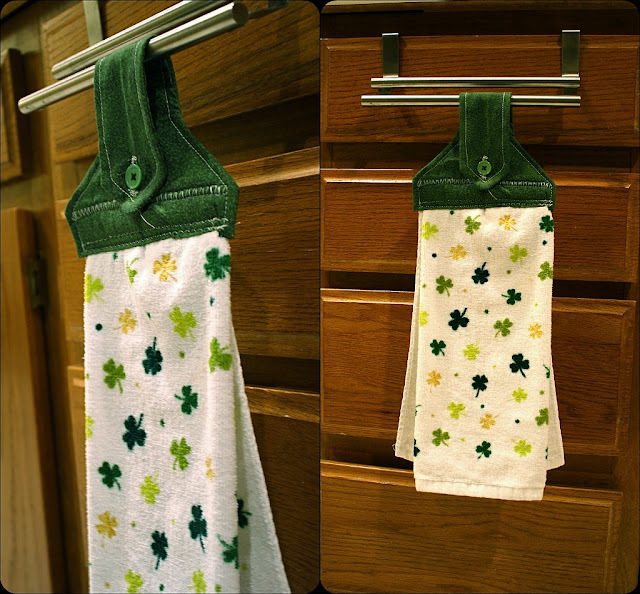 I started to put up our St. Patrick's Day decorations when I came across this towel. I figured it would be a good time to try out the pattern, so I cut the towel in half and found some old fabric lying around in my fabric box. After I traced and cut, I had to layer 3 of the pieces. The first piece goes right-side up, the other two are right-side down. They are layered this way because you will sew them, then flip it right-side out. Make sure to pin the pieces together so that they stay in place as you sew. Sew a 1/4 inch hem around all sides - just not the bottom. Then I tucked the towel into the bottom. First, I sewed the towel/handle about 1 inch from the bottom of the handle. Then I put a little less than 1/4 inch hem around the sides. Then I added a final 1/4 inch hem at the bottom of the handle just to be secure. Now, putting the hems was hard for me because the towel + handle was very thick. I had to rip out many hems because the thread kept gathering underneath the backside of the towel. I finally changed the setting for the one hem. If you notice, there are two different hems when sewing the towel to the hanger. Then, the button hole came. I folded the loop part down to see where the button would go. Then I cut a slit. Around the slit, I tried to sew it together. It's not pretty, but it works. Like I said earlier, I might just sew a snap button on the next time I make one. I'm extremely happy and proud of the final product. I've already lined my mom up for the other half of the towel. How do you hang up your towels? Stuff them in the drawers? On the drawer pulls? Oven? Where did you get the over the drawer towel holder? Later, I ended up getting a single bar'd one because the double one just got in the way. 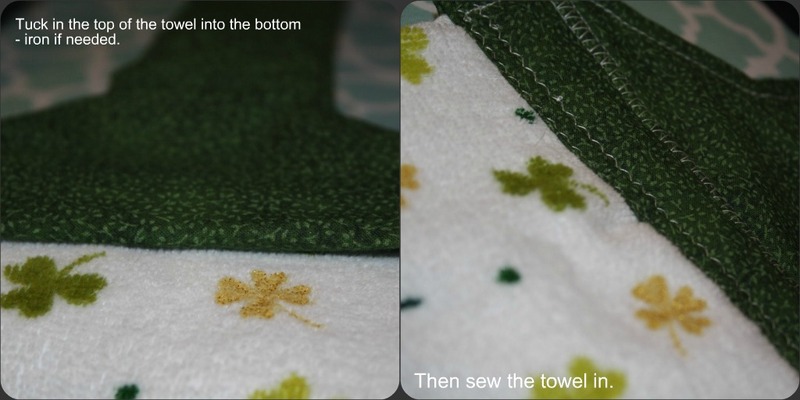 how to find pattern for the top of towel? I've Got the Hang of It!